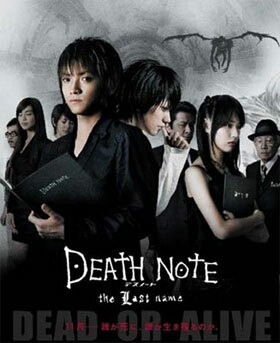 (top) Death Note: The Last Name theatrical poster, (middle) Kenichi Matsuyama, Tatsuya Fujiwara, and Erika Toda, and (bottom) the CG-created Ryuk. The Skinny: Second part of the live-action manga adaptation succeeds thanks to its wicked concept, though the film's uninspired direction and questionable acting do hurt matters. As an overall film, Death Note: The Last Name is barely passable, but those versed in the manga will likely find this a must-see. When we last left Light Yagami (Tatsuya Fujiwara), he had just perpetrated the most elaborate and successful demonstration of his Death Note, the supernatural notebook that kills anyone whose name is written inside it. As a result of his clever scheming, Light was invited to join the investigation team chasing the mass murderer known as Kira - who just so happens to be Light, anonymously using the Death Note to kill scores of criminals daily. However, oddball super detective and avid sugar-lover L (Kenichi Matsuyama) truly suspects that Light is Kira, and he's not shy about letting Light know. During their initial and subsequent meetings, L basically rubs Light's face in his obvious suspicion. However, instead of avoiding potential capture, Light embraces the chance to work side-by-side with his sweets-loving rival. Now that L and Light/Kira are working together, the stage is set for an epic battle between two insanely smart guys who like to talk a lot. It's a showdown of acrobatic mental geniuses, who use keen reasoning and elaborate mindgames to outwit their wily opponent. Who will be the last name written in the Death Note? Will it be the megalomaniacal Light, or the wacky but honorable L? And will Death Note fans pissed at the fate of the manga characters find this new cinema version to be satisfying? The answer to that last question: yes and no. One portion of the Death Note fanbase won't be that happy because the fate of one character doesn't stray very far from his destiny as detailed in the manga. However, another portion of the fanbase should be tickled pink because the other character is served much better than his manga counterpart was. What does that mean to those not versed in Death Note lore? Probably nothing, though there's still some enjoyment along the way. That is, if you can stay focused. Death Note is a very cerebral manga, and derives its thrills from mindgames, obtuse mental jousting, and layers of doublespeak that play much better on paper than on celluloid. Director Shusuke Kaneko doesn't do much to make the already wordy events of the manga more enthralling on film, and inserts plenty of wooden exposition to keep the audience tuned in - if they haven't fallen asleep. The first Death Note movie ended with the promise of L and Light's coming conflict, but because the sequel has to compress many volumes of manga into 141 minutes, much of the back-and-forth rivalry between L and Light gets excised in favor of talk, talk, and more talk. The uninitiated could get bored, and simply wonder why the two male leads wear so much eyeliner. The unitiated might also be bothered by Erika Toda, who plays teenybopper popstar Misa Amane. Misa is egregiously perky and pouty, and the adorable Toda can be as annoying as she is charming. 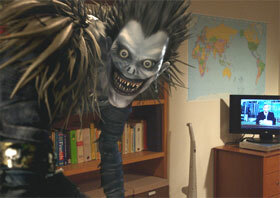 Misa enters the picture as the possessor of a second Death Note. Since she's a huge fan of Kira, she also uses the Death Note to punish criminals, and even becomes known as the "Second Kira". However, Misa is sloppy and not very smart - she's easily pinched by L, who figures that if Misa is the Second Kira, then her new boyfriend Light is the first one. It's smart thinking, but Light has his own elaborate plan built upon the Byzantine rules of the Death Note itself. Light's plan involves handing the Death Note to a third party, Kiyomi Takada (Nana Katase), and getting her to do his dirty work for him. Kiyomi was also in the manga, but her film counterpart is actually an amalgamation of three separate characters. Still, her function is more or less the same as the manga. Basically, she's a pawn used by Light to prove his supreme smarts, and it works just as entertainingly on film as it did in the manga. Seeing Light's elaborate plans getting played out onscreen can be quite exciting, even though it basically invites whole pages of exposition to explain it all. Not helping matters is the acting, which ranges from effective (Kenichi Matsuyama makes a lovable L) to labored (Tatsuya Fujiwara strains a bit as Light) to wooden or overdone (most of the supporting actors). Again, director Kaneko's handling is far from imaginative. Nearly everything that happens in Death Note: The Last Name also occurred in the manga (though perhaps in a less truncated form), and Kaneko translates it to the screen in a slavish and entirely too-routine manner. The film could have used more creativity or cinematic verve, but the most creative thing that the filmmakers probably did was persuade the Red Hot Chili Peppers to lend two of their songs to the soundtrack.